This recent settlement involved an accident while performing work duties. 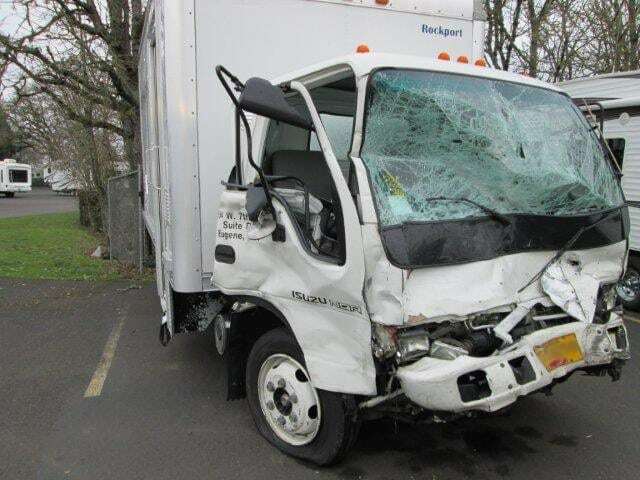 Our client was the driver of an Isuzu Truck traveling north on SR 99 nearing the intersection of SR 99 and Milliron Road in Eugene, Oregon. The other driver was traveling west on Milliron Road approaching the intersection with SR99. Westbound traffic on Milliron Road is controlled by a stop sign at the SR 99 intersection. The other driver failed to stop at the stop sign and entered SR99 into oncoming traffic causing our client’s vehicle to collide with the other driver. The police cited the other driver for Careless Driving. Our client sustained very serious fractures to his left leg and injuries to his right thumb and chest. He was hospitalized following the accident for 10 days. While in the hospital, he underwent surgery to repair an open right tibial wound with tibial plateau fracture and closed right femur fracture. Multiple small bone fragments were removed during surgery and his ruptured patellar tendon and patellar tendon avulsion required extension repair and well as repair of a rupture of the medial retinaculum. A second surgery was performed on his right thumb to repair the MP joint ulnar collateral ligament. Upon release from the hospital, he underwent rehabilitation for another two weeks. Our client’s medical care was monitored by orthopedic specialists and he was unable to return to work for one and half years. His medical expenses totaled over $202,000.00 and he received wage loss benefits in the amount of $65,750.51. Our client was on-the-job at the time of the accident and his worker’s compensation carrier was required to pay for all of his medical bills and lost wages, which created a lien against his recovery in the amount of $242,001.55. By Oregon law, the worker’s compensation carrier is entitled to reimbursement of their lien from the settlement from the bad driver. The bad driver’s insurance company refused to reimburse the worker’s compensation carrier for their entire lien, which meant that their reimbursement would affect the amount that our client received from the settlement. We filed a lawsuit, but we were able to continue negotiations with the bad driver’s insurer and the worker’s compensation carrier. We were able to negotiate with the worker’s compensation carrier and convince them to accept far less than they were legally entitled to recover pursuant to Oregon statutes. Further, we were able to convince the bad driver’s insurer to increase their offer to $363,000.00 so that our client was able to put more money in his pocket. If you or a loved one have been in a car accident, contact us today for a free consultation. At Dwyer Williams Cherkoss we fight to ensure our clients are fairly compensated for all their injuries.